Note: I recently read this book to my daughter. It was a long time after this review by Laura Peterson originally appeared on SW and an even longer time since Laura and her sister Kristen (who does social media for SW–yay!) gave our family a copy of this book. My wife had raved about it. I nodded, saying I would, “get around to it.” It took a while, but I finally did. Wow. Wow. Wow. Seriously. Wow! How great is that?! Does he tell her she must continue the family business? Do great things and become rich and famous? Nope. “Do something to make the world more beautiful.” Alice accepts this charge, and then she goes about her life. She grows up, works in a library, travels to faraway places, meets interesting people, and eventually she does come home to live by the sea. She has seen and experienced so much; but, what can she do to make the world more beautiful? “The world is already pretty nice,” she thinks. One spring after an illness, she notices that the wind has blown some lupine seeds from her garden and taken them over the hill, and there’s a beautiful new flower patch where before there was nothing. Struck with inspiration and touched by the beauty of the flowers, she wanders the hills and valleys of the town, sowing lupine seeds everywhere she goes. A year later, the little village by the sea is transformed by the blue and purple and rose-colored lupine blooms. Alice has done it; she’s done something to make the world more beautiful. 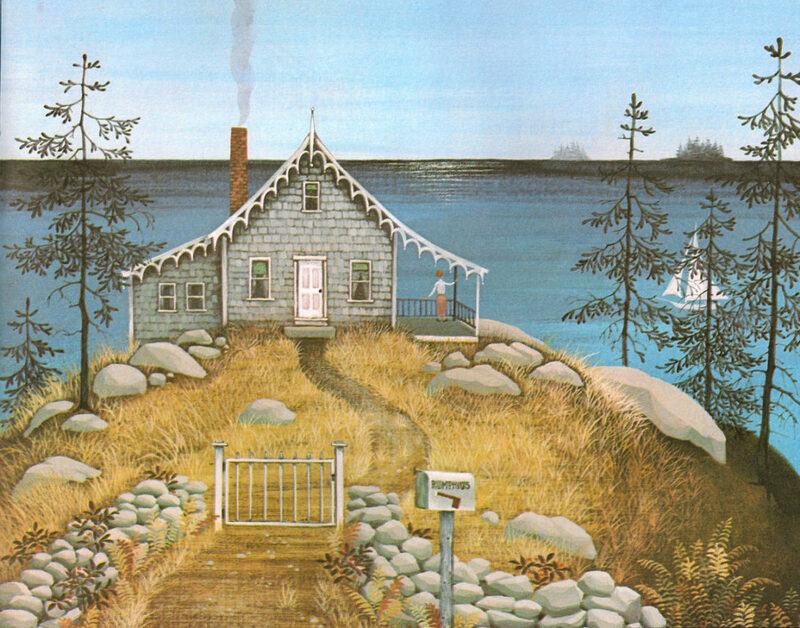 This story rings a bell in my heart because it’s so simple, and so welcoming. The messages that I hear directed towards kids today are often much more complicated and demanding; get good grades, AND be involved in as many activities as possible, AND go to a good college, AND land a good career, AND become wealthy, etc. There’s none of that in Miss Rumphius. Be you butcher, baker, or candlestick-maker, it proclaims, just do something to make the world more beautiful. It can be as simple as planting a garden. I’m also oddly encouraged by Alice’s uncertainty in the book. Her first response to her grandpa’s charge is to wonder what she could possibly do to fulfill it…but does she let that trouble her? No. She’s not suffering the type of vocational crisis that I think our well-meaning Christian culture can emphasize, worrying over what her “calling” is. She goes through her life, and when she sees an opportunity to bring beauty to a place that was short on it, she takes it. That’s all. She’s done something to make the world more beautiful. I need to hear that, to remind myself (and the other “do-better, try-harder” types out there) that life doesn’t begin when we find what we’re “supposed” to do. There are adventures to be had, places to go, people to meet, and it’s in the midst of all that (or even after we think most of our adventures are finished) that we can still find chances to bring beauty to those around us. All that, and gorgeous illustrations to boot. 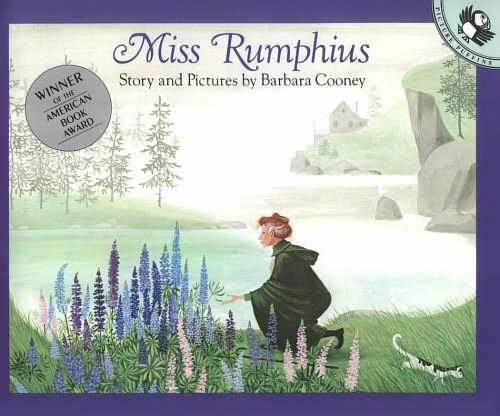 Miss Rumphius is for all of us who want to do something to make the world more beautiful…even if we don’t know yet what that can be. Miss Rumphius is a BELOVED favorite of mine. What a gift to hear you highlight some of what resonates most in my heart too. I adore Miss Rumphius! It’s one of my most frequently recommended picture books. I tell parents that no child should grow up without this story firmly imprinted on his or her soul. Thanks for sharing it here, so more families can share this gem. And thanks, Sam, for re-running this post. I’m with you: wow. I’m so glad to hear this, Kimberlee. It’s one of those gems that I worry people will forget about. So glad you are sharing it too! Bought this for my daughter’s birthday, and we’ve read it over and over. THANK YOU for the recommendation! YAY, Helena! That makes me so happy. You’re welcome!